Food GrainsWe manufacture and provide a broad range of Indian Food Grains comprising Maize, Barley, Bajra and Sorghum (jwar). Most of our clients prefer them, as they are free from fats and contain exceptional protein content. Our excellent quality based food grains are available in air tight containers, ensuring natural taste and nutrition value for a longer time period. We process all our Indian Grains through highly mechanized equipment and offer them to our clients at most reasonable prices. Ground NutsThe different varieties of Ground Nuts offered by us is includes Blanched Peanut Blanched Peanut Splits, HPS Ground Nut Kernels Bold, HPS Ground Nut Kernels Java and HPS Groundnut Shelled. These have a rich sweet taste, nutty flavour, crunchy texture and a relatively longer shelf life. We pack these products in quality packaging material to avoid any kind of bacterial contamination. SpicesThe Grinded Indian Spices are more than just ingredients to add flavour and aroma to different food. Our Indian Spices like Chili Powder, Fennel Seed SAUNF, Fenugreek Seeds (Methi), Turmeric makes the food mouth-watering dish. These are also known for many medicinal uses and are used for many home remedies. 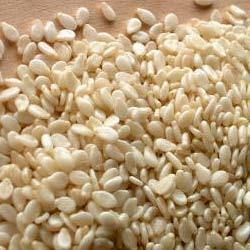 We provide Hulled Sesame Seeds which belong to the top grades. These are hulled at times manually and at other times mechanically. At Agro India we make sure that these are thoroughly cleaned and processed such that their richness and flavours are intact. These are rich in iron, magnesium, proteins and Vitamin B. The calcium phosphorous content in these seeds is also very high with slight difference with regards to unhulled seeds. It helps cure Anemia and prevents diabetes. It contains anti – cancer properties. Sesame seeds help in providing relief from Rheumatoid Arthritis. It is a good treatment for Anxiety. Our business objective is to be a reliable, innovative and dynamic business partner by providing high quality business solutions to develop a strong and long-term relationship with customers and stakeholders at large. © Agro Ind Group 2019. Website designed by Aheadzen Media P. Ltd.